On August 21, 1999, steinologists around the world celebrated the 150th anniversary of the birth of Heinrich Schlitt. They raised their steins and paid liquid tribute to the works of art which this man created in his lifetime of 74 years. Schlitt's steins come playfully to life in this card table scene from Mettlach PUG 4.8 L master stein 1059(2488). Heinrich Schlitt??? To the uninitiated the crowded consonants may sound unusually harsh, even when slightly Anglicized. Yet these two words cannot help but evoke a murmur in the hearts of all but the most blasé collectors of Mettlach stoneware, one that threatens to become a shout of ecstasy. Collectors of antique drinking vessels place a particular value on those pieces in their collections on which these two words, Heinrich Schlitt, or a portion thereof, have been affixed. 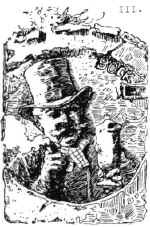 The mere mention of his name brings to their minds' eyes a myriad of images: the bold audacity of the thirsty knight, der durstige Ritter; the wizened visages of avaricious gnomes, mellowed by just a tinge of wry good humor; the anthropomorphic treatment of tankards and pretzels, sausages and steins, devils and playing cards, towers and trees. Yet, when I did my initial research on Heinrich Schlitt some twenty years ago, there were many unanswered questions about this man. Who was he really? What did he look like" When did he die? Was he a native son of Munich, the Bavarian city with which his name is almost always associated? Is his work to be found on steins and plaques alone? I attempted to find an answer to each of these questions and enjoyed a fair degree of success. I hoped that my research would bring to light other facts about the life of this man whose work is so beloved by steinologists the world over. Indeed it proved to be the impetus which eventually resulted in the publication ten years ago of a book. Heinrich Schlitt 1849-1923, jointly authored by J. A. Schmoll and Thérèse Thomas. This beautifully illustrated treatise provides detailed information on Schlitt's work as a painter of genre scenes, of dwarves and murals and as a designer of Mettlach ceramics respectively. Three of the photographs which accompany this article are taken from this book. 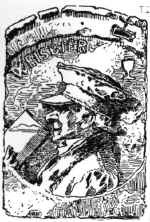 Herr Schmoll writes, "We see Schlitt standing... with a smile on his face in the glaring sun, wearing a derby hat, with the usual cigar in his right hand and a walking stick in his left. His coat cannot quite hide a mild paunch, and his legs blend into the shadows. 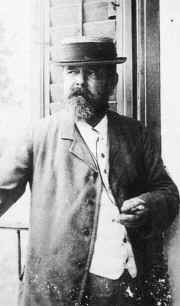 So this is how Schlitt looked at the age of forty in the year 1889,... a year before he went to work on the Rathskeller in Wiesbaden. The other photograph of Schlitt ... shows a much older artist. It was summertime, and Schlitt was wearing a straw hat. His attire was more meticulous, his light-colored vest almost festal. Could this picture have been taken on the occasion of Schlitt's 50th birthday in late August 1899, when his friends surprised him with a banquet and lots of mischief? The man in the picture looks earnest, even a little wary. There is no twinkle in his eye as in the other ferrotype, his beard is turning gray and there is something melancholy in his sideward glance, ... with advancing age (he) grew lonely, eccentric and depressive." Yet one of his closest friends says of him, "He was always a good comrade, jolly and full of fun,... (although) he was very shy of people." 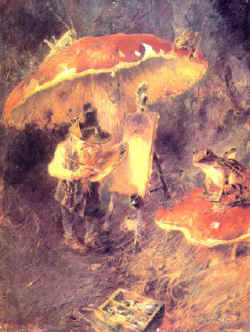 Herr Schmoll goes on to state, "Seen in that light, Schlitt's preoccupation with the gnome theme in his painting gains significance. It appears to be the artistic projection of his emotional problem. The little beings are everywhere, unseen, spying on him, whispering behind his back. ... For Schlitt, they probably constituted some kind of reality that other people could not perceive - a reality he had to contend with all alone." (from the cover of "Heinrich Schlitt 1849-1923"). Heinrich Schlitt was born in Biebrich-Mosbach near Wiesbaden in Nassau on the Middle Rhine. Wiesbaden at that time was part of the Duchy of Nassau, but is now the capital of the German state of Hessen, the very territory from which the Hessian "mercenaries" of American Revolutionary War fame originated. A propensity to the arts made itself felt early in his life. Although he was later a pupil of the historical painter Wilhelm Lindenschmidt, the first person to guide his footsteps down the artistic path was the highly talented Wiesbaden artist Kaspar Kögler. Schlitt regarded Kögler as his mentor. Indeed it was Kögler who helped him in a practical way to come into his own element so early. He was one of the favored few who was able to secure and maintain a comfortable livelihood in the arts early in his career. Schlitt's exquisite sense of humor proved to be most useful in this regard. Schlitt was frequently occupied as an illustrator and as an artist using all sorts of material (wood and stone, ceramics, clay and metal). 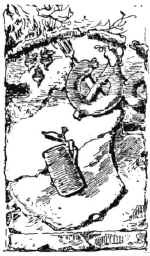 His illustrations in periodicals of that time numbered in the hundreds. Most of his work came to be known to the general public through these illustrated magazines. Had he been born a century later, I feel certain that his path would have led him directly to Walt Disney's door. As it was, in the early 1870's Schlitt's path led him to Munich, capital of Bavaria, one of the largest kingdoms in the newly-established German Empire. Under the tutelage of the aforementioned Lindenschmidt and his first teacher in Munich, Ferdinand Barth, he began his study of oil and watercolor painting. Almost all of his paintings from these decades leading to the turn of the century reflect Schlitt's belief that his work as an artist should be concerned with a portrayal of the more humorous aspects of life. By the age of 40 he had at least 40 major easel paintings in oil and watercolor to his credit. Unfortunately for the general public, these works of art were for the most part owned, even at that time, by private collectors, most of them in England and the United States. Only a very few actually remained in Germany. Schlitt's role as one of the principal artists for the ceramics firm of Villeroy and Boch in Mettlach is well-known to collectors of antique drinking vessels. The Schlitt paintings which adorn the walls of the Rathskeller in the Munich town hall are recognized by his admirers to be among his finest. Less well-known, but in many ways superior in execution to this work in Munich, is his collection of 30 original drawings and four murals (actually "casein frescoes") which form a most definitive pictorial history of what could be termed Bier-Kultur. These works were specifically designed to be used in the decoration of the walls of the Bierhalle in the Rathskeller of the town hall in Wiesbaden in the spring and summer of 1890, when Schlitt, at age 41, returned to his native province from Munich to work with his old friend and mentor, Kaspar Kögler. An interesting footnote to the research which I initiated twenty years ago was that I could find no reference book which listed the life and work of Heinrich Schlitt which also made reference to the circumstances of year of his death. Professor Schmoll was able to provide us with that information. In his book he relates that Heinrich Schlitt died in Munich on November 13, 1923, having spent his latter years in increasing solitude. He was buried at Munich's Waldfriedhof cemetery in the section reserved for artists' tombs of honor. Professor Schmoll concludes by saying, "His grave can be found in a glade in Munich's expansive Waldfriedhof (woodland cemetery), near a memorial column dedicated to all the Munich artists who have been laid to rest there." Subsequent articles in Prosit will feature Schlitt's four murals and will provide the reader with a better idea of the unique way in which Heinrich Schlitt viewed certain events in the history of his world. Before we give ourselves over to a study of these four murals, let us look first at the representations on those portions of the four arches which abut the central pillar. At the very center of this subterranean beer-temple, Schlitt has symbolized several types of libation which are common to the vast realm over which Gambrinus, the legendary patron saint of beer, holds sway. In these portraits in mock relief, sketched gray on gray in the form of medallions, we first note a valiant defender of the fatherland whose epaulets identify him as a military musician. This good fellow has a thirst which in his double role as soldier and musician in naturally twice as big. But this eager desire for a brew stands in sharp contrast to his pocketbook and so he must slake his thirst with the cheap but truly delicious Batzenbier, a beer which, as the name implies, goes back to an age when small coins known as Batzen were still in circulation. This beer is more well-known in other areas as simple - old - or brown beer. This dignified townsman in his grandfather cap is embracing an unpretentious Weissbier, a beer which is particularly refreshing during the heat of summer. One wonders that he is even capable of swallowing at all, wearing as he does the stiff old-fashioned collar so well-known in the Rhineland of the early 19th century. This admirer of Bock has achieved a higher degree of perfection in beer gusto. Here is a man whose comfortable countenance and top hat reveal that he can well afford the more expensive but heavily brewed bock beer. A tankard of genuine Klosterbräu (cloister-brew) represents the highest of all sentiments for every devoted admirer of fine beer. These connoisseurs are all in tacit agreement that the pious spiritual gentlemen of the monasteries are without peer when it comes to the preparation of "spirited" beverages. Even those not privileged to taste a genuine Benedictiner at the source or to sample the brew from the holy mountain of Andechs, would probably be in agreement with this statement. On the walls which faced these "meditations" Schlitt portrayed with great good humor the awesome consequences of boozing, as well as the means to overcome such an affliction. If we interpret the symbols correctly, we can assume that they advise us to lift the sundry consequences of an evening spent not too wisely but well, by the simple expedient of lifting another lid and completing the gesture with the enjoyment of three radishes and a fine Weisswurst (figure 5). Ein Prosit! from Heinrich Schlitt! Color illustrations were added to the original article by Walt Vogdes, webmaster.